Mexico recently marked the 150th anniversary of Cinco de Mayo–the commemoration of the Battle of Puebla, which halted an invasion by the French–with an array of festivities and special events. 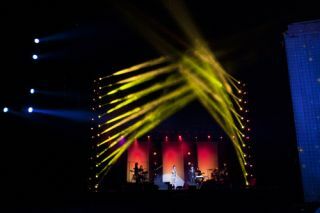 Clay Paky Sharpy fixures and grandMA2 lighting consoles were used for the Cinco de Mayo Spectacular, the nighttime gala orchestrated by Five Currents, the production company for the 2011 Pan American Games Ceremonies in Guadalajara, Mexico. A.C.T Lighting is the North American distributor of both Clay Paky Sharpy and grandMA. The Cinco de Mayo Spectacular, hosted by former Miss Universe Ximena Navarrette, featured an appearance by the Mexican president and a display of fireworks. It was staged at the Guadalupe Fort in Puebla; the city is a UNESCO World Heritage Centre. Televisa broadcast the event nationwide. Lighting designer David Grill, of David Grill Associates, Inc. in Mahwah, New Jersey, specified a grandMA2 for control of some 375 moving lights during the Spectacular and utilized a second full size MA2 as a backup console. A grandMA2 light served as the focus console remote. Solotech furnished the complete system.